OK, guys. We know you haven’t even thought about Valentine’s Day yet. Or girls. Girls forget, too, believe it or not. So all y’all forgettin’-Valentine’s-Day-types, listen up: Valentine’s Day falls on a Saturday this year, which is pretty great because it means you can get away from the V-Day dinner and turn it into a romantic weekend getaway in Durango. To help you figure out what to do, we’ve rounded up some ideas for you and your S.O. (significant other). 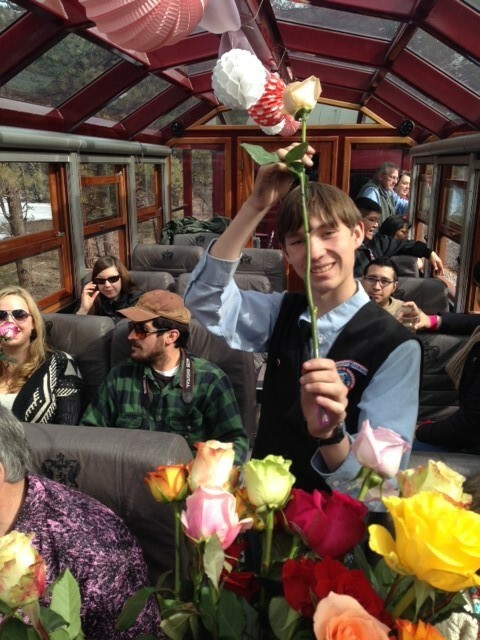 The Durango Valentine’s Day train sold out last year, so get your tickets soon! The historic passenger cars will be decked out in Victorian elegance and dripping with romantic ambiance for the Romance on the Rails Train. Couples can nibble on chocolate covered strawberries on the trip to Cascade Canyon and enjoy handmade mini mocha cups on the ride back. Passengers who buy the premium class package will enjoy a brunch buffet and champagne or sparkling cider, and the ladies will receive a red rose. About an hour after departing from the downtown Durango depot, a buffet featuring fruit kabobs, french toast and smoked salmon and cream cheese crostinis will be served. Musician Robby Overfield will also be playing guitar and singing. Snowshoe Valentine’s Day Tour, 3:30-7:30 p.m. Couples will be able to ride the chairlift to the top of the mountain and take a guided snowshoe hike, followed by a wine, cheese and fruit party at the Powderhouse. The guided tour costs $65 per person and includes snowshoes, the chairlift ride and snacks. Valentine’s Lunch at Backside Bistro, 11 a.m. to 2 p.m. The bistro is offering a special V-Day menu for two as well as live music by Ace Revel. Reservations are strongly recommended. Call 970-385-2175 or email kscarborough@durangomountain.com. 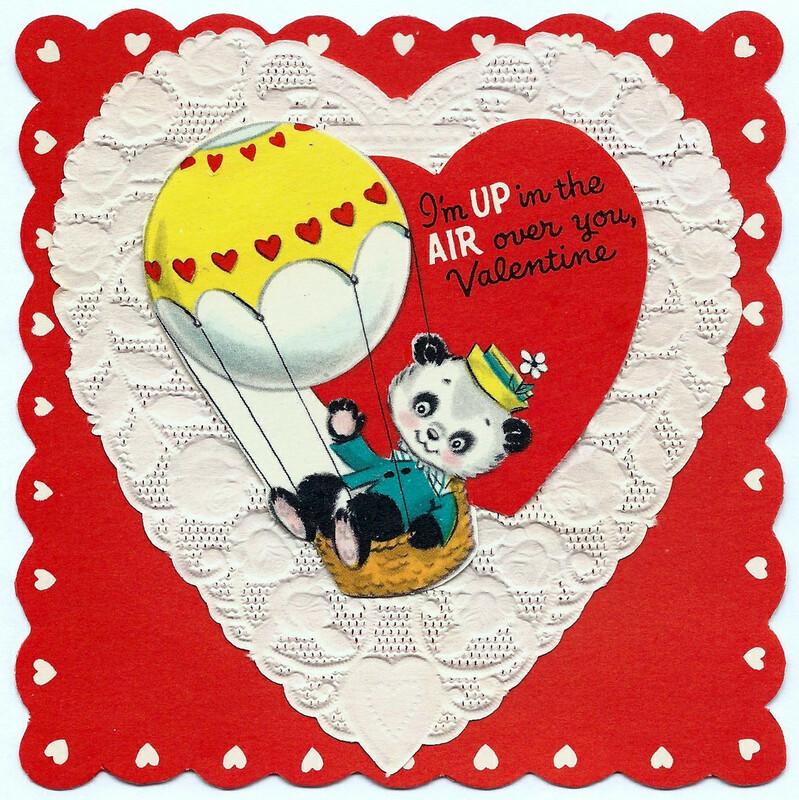 Valentine’s Couples Dinner at Purgy’s, 5-9 p.m. This special six-course dinner for couples will be accompanied by live music provided by Lacey Black. Reservations are strongly recommended. Call 970-385-2121. Steamworks Deck Party at Dante’s, noon-2 p.m. Join the crew of Steamworks Brewing for games, great beer and good times. Ska Brewing Snowboard Giveaway at Bear Bar, 4 p.m. This will give you another chance at redemption in case you forgot to buy her (or him) a present. Fingers crossed you win, or you could be in big trouble! Buck’s Livery: Every evening at Durango Mountain Resort every, teams of Belgian and Percheron Draft horses pull sleighs of 10-12 people through a snow-covered landscape. The livery provides blankets for warmth. Slope sleigh rides are at 4 p.m., 5 p.m. and 6 p.m., and reservations are required. For more information or to make reservations, call 970-385-2110. Rapp Corral: Rapp Corral has been providing horse-drawn sleigh rides since 1984. The corral has five different sleighs to customize your experience, including a cozy two-seater that’s perfect for the romantic ride to a warming hut where you can sip hot cocoa (although we’re sure you two will be keeping each other plenty warm — hubba hubba). 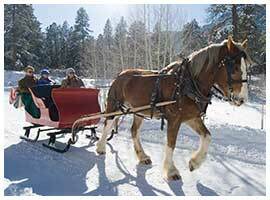 Call 970-247-8454 to reserve your sleigh. Make your romantic weekend getaway complete and book your room with us at the Durango Quality Inn. All of our rooms have been recently updated, and we’re on north Main Avenue, close to both downtown Durango and Durango Mountain Resort. Happy Valentine’s Day, you crazy kids!